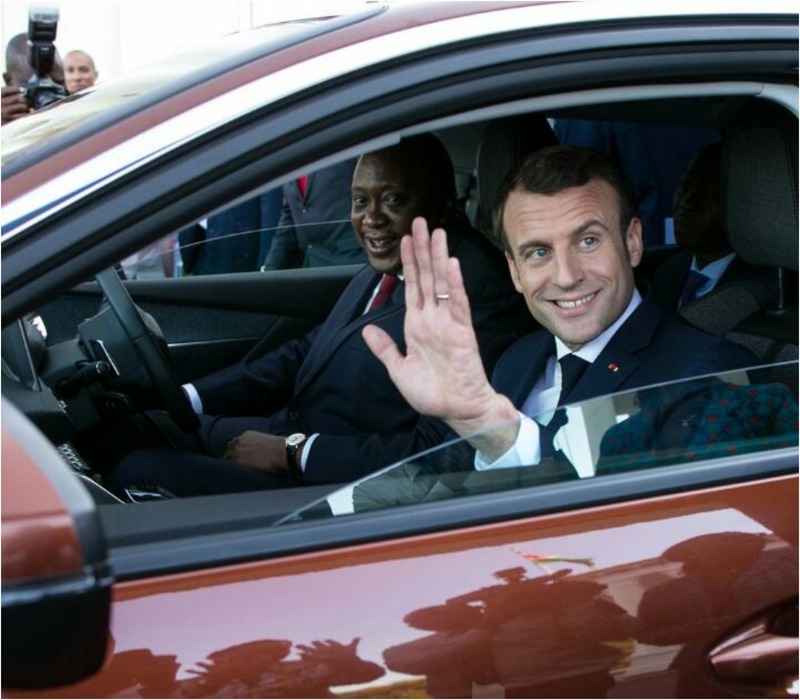 President Uhuru Kenyatta and French President Emmanuel Macron on Wednesday unveiled the Peugeot 3008, one of the models locally assembled in Kenya by French vehicle manufacturer, PSA Groupe, in a move geared towards boosting Kenya’s manufacturing sector. Addressing the press in Nairobi, after unveiling the new model of Peugeot, Kenyatta reiterated his call on all state entities to buy and use locally assembled vehicles and spare parts. “This policy directive is intended to promote our agenda on manufacturing, creating good jobs for our people, and enhancing technology transfer. Kenyatta noted that the Peugeot 3008 is a high-performance vehicle with great fuel consumption and lowest emission in its class. “It is also a hardy vehicle, having been tested in several parts of Kenya,” Kenyatta said. Kenyatta said it was encouraging to note that when the KVM plant is fully operational, the PSA Groupe hopes to assemble at least 15,000 vehicles annually in Kenya for both the local and regional markets. Kenyatta praised the historic visit by President Macron, the first to Kenya by a French President. “Mr. President, your visit signals our shared commitment to foster our bilateral relations and engagements within the region in various ways which will deepen, expand and strengthen our bonds of friendship and cooperation for the mutual benefit of our peoples,” Kenyatta said. “This is good for Kenya and for our development. Today, France is our 17th largest trading partner; my expectation is that France will grow into an even more important trading partner for Kenya as a result of this visit,” Kenyatta said.